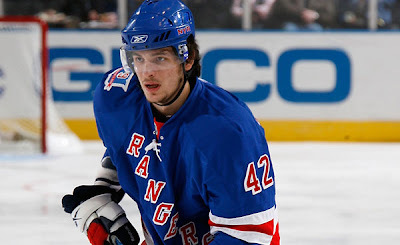 The Dark Ranger: HEART'S not Enough..
Artem Anisimov’ first 2-goal game opened some eyes from fans wondering when the youngster would finally live up to the potential he was rumored to have before being brought up to the Rangers. Last night, its hard to say he didn’t do his best to live up to that. His cut across the middle and using the defensemen as a screen was definitely pro move on the 1st goal and the effort on the second goal is something the Rangers should be looking for in their young players. Unfortunately , it wasn’t enough. Official recap here , if you can stomach it. 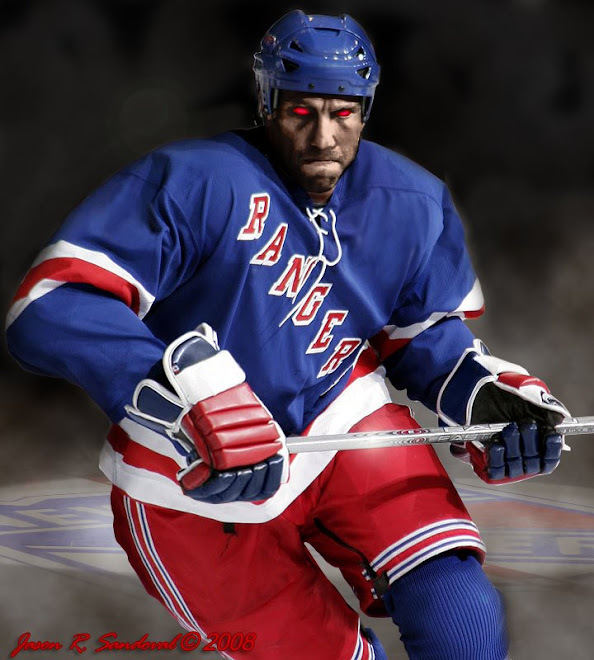 So here we are again Ranger fans… A good effort from few players and the rest of the team that took turns being invisible. It was kind of expected, wasn’t it? I mean we can all act surprised now and go, "I can’t believe that one got away from us…". Or we can admit to feelings going in that we were going to get run ragged by a Pens teams with a balanced offense and all that fancy stuff, like guys that stick to their defensive assignments, make intended passes and an offense that sets up immediately and follows the plan. Trivial details on a team such as ours, where our D-men do just fine being steamrolled along the boards every 5 seconds and our forwards break out like packs of Vietnamese soldiers trying to outrun a firestorm. All this complaining is still getting nowhere… Unfortunately, as fans, its sometimes all we’re left with and it is the tie that binds us. So maybe it’s time we start taking stock in this team. Now before I start, I am not saying the defending cup champs (that were practically escorted to and through the cup finals) are the model team. In fact, taking a look around the league, there are a few young teams (like Chicago) that are showing a lot of promised and proving themselves a force to be reckoned with. So how is it that stalks of youth players are shooting up all over the league and ours is growing slowly and unevenly? It’s common knowledge that a seedling growing in the shadow of an old tree will never get enough sun to reach full size, if it survives at all. Our youth right now is growing in the shadow of more experienced teammates that play a soft game. The money and the contracts dictate that these vet players are important. That might be true if there were used effectively to bring along and teach the fine points of the game to the youth. Instead, they dictate the pace of the games, and the pace of the practices and breaks (hear about anymore Tortorella bootcamp practices lately? Yea me neither.) Moreover, they are dictating the mood of this team on the ice. Earning a contract on star power and then playing the diva that has had their ego shattered by a tough crowd at the garden has gotten to some of these players and they are setting a bad example for their younger counterparts. What’s more telling is that the younger players are full of energy with nowhere to go because they have no idea where they belong… in the play, on the ice, or on this team. Young Anisimov is a classic example of this. Last night, he either sat around waiting around for someone else to score or he took upon himself to do it. Too often these young kids are waiting for their older counterparts to lead the way only to hear the final buzzer and think “$hit… I could have done that…”. The vets on team don’t do crap because they are either afraid of getting yelled at or can’t be bothered. What is clear is that, they need to be turned before anyone else. It’s no secret that of the players that stood out on this team this season.... Callahan, Gaborik and Lundqvist aren’t waiting to be told to do what they know how to do … And between the other two, Avery yelled back at the coach during the game and Prospal told the coach where to stick his criticisms once upon a time in Tampa Bay. The others however are looking for validation and correction and it needs to be dished out with authority. Young teams like the Pens, Chicago and LA have drafted well, but their players are made well aware of what they need to do to stay in the NHL and get ice time with their respective teams. How is it that rebellion of youth can accept guidence and take direction better than proven NHL players. The answer must be in the delivery of the directions.